Dusseldorf, Germany, November 12, 2014 — NDS Surgical Imaging (NDSsi) will unveil a suite of advanced medical visualization technologies at the MEDICA World Forum for Medicine International Trade Fair, November 12-15 in Dusseldorf, Germany. 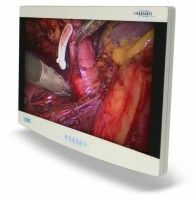 The new 27” Radiance® Ultra high-bright surgical display, to be released in 2015, is one of the industry’s brightest, allowing recessed anatomy to be more easily visualized during endoscopic procedures. Proprietary color calibration helps increase clinician confidence in image consistency from room to room, throughout the product life. Seamless, edge-to-edge glass enables quick and effective disinfection and faster OR turnaround. NDS Surgical Imaging’s technology innovation preview includes 4K-resolution (3840×2160 pixels, Ultra-HD) medical imaging displays, as well as advanced 3D imaging demonstrations. Expanding its leadership in LED backlight, NDSsi will showcase the newly released 19” and 32” Radiance G2 high-end surgical monitors, along with the affordable, feature-rich 15” and 19” EndoVue® HD LED products. The award-winning ExpandOR™ medical-grade bi-directional HD video/audio streaming appliance exemplifies NDS Surgical innovation. ExpandOR is the only device of its kind offering secure multi-node capability, enabling video streaming to multiple selected audiences simultaneously, allowing increased clinical staff efficiency via enhanced hospital-wide communication with the OR. NDSsi will also demonstrate the advanced 9-channel wireless imaging of ZeroWire® Ultra. The next generation of NDSsi’s award-winning technology, ZeroWire Ultra utilizes an innovative system of “Time Frequency Coding” to create nine non-interfering channels, allowing more wireless devices to function simultaneously, thus helping to eliminate cables, reduce cleaning time, and improve OR safety. NDS Surgical Imaging’s benchmark of sharpness and clarity was well received at MEDICA 2014, Hall 10, Stand G14. NDS Surgical Imaging website is http://www.ndssi.com.